Curated chamber works commemorating the fifth anniversary of the Boston Marathon bombing. Celebrating the release of Juventas’s album, You Are Not Alone, featuring chamber music by Artistic Director Oliver Caplan. Kick-off for Boston New Music Festival featuring circus arts, indie opera, and the latest in contemporary instrumental performance. Aerial artists team up with composers and instrumentalists to bring forth an unparalleled audio-visual experience. A multi-media, multi-sensory experience that animates sound through robotics, visual stimuli, and interactive computer technology. Discovering the future of music through the next generation's compositional prodigies. Featuring young creators from Walnut Hill School and NEC Prep, along with students from Juilliard Prep. A transgender man from Afghanistan immigrates to the American South in this world premiere opera about a collision of cultures that shakes the foundations of what it means to be an American in a post-9/11 world. 100 years of modern music brought to Life through puppetry and abstract performance art. Featuring three premieres, renowned flutist Carol Wincenc, and Andrew Arceci on Viola da Gamba. In collaboration with contemporary dance company The People Movers. A new ballet based on the global hacktivist group known as Anonymous. A psychological thriller about reality and the supernatural. 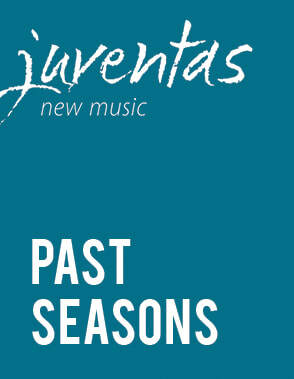 Each year, Juventas' PROJECT FUSION brings you collaborative projects, from live painting, to politics, to choral works. **Performance made possible by a generous grant from the Free for All Concert Fund, Inc.
Generation N.O.W. : New. Original. Wild.